Have some fun! Start with Greg Percy's song Picasso Polka - do a little dance too! (Pablo Ruiz y Picasso), 1881-1973, Spanish painter, sculptor, graphic artist, and ceramicist who worked in France; the foremost figure in 20th-century art. Leader of the School of Paris, he was remarkable for his technical virtuosity, incredible originality, and prolificacy. Admitted to the Royal Academy of Barcelona at 15, he later moved to Paris, where he remained until 1947, then moving to the South of France. His early works, e.g., Old Woman (1901; Philadelphia Museum Art), show the influence of Toulouse-Lautrec. His production is usually described in series of overlapping periods. In his melancholy blue period such works as The Old Guitarist (1903; Art Institute, Chicago) depicted, in blue tones, the world of the poor. His rose period is characterized by a lighter palette and subjects from the circus. In 1907, Picasso painted Les Demoiselles d'Avignon (Museum of Modern Art, N.Y.C. ), the most significant work in the development of "Cubism" and abstraction, and a forerunner of analytic cubism. In the synthetic phase of cubism (after 1912), his forms became larger and more representational, as in Three Musicians (1921; Museum of Modern Art, N.Y.C.). In the 1920s he also introduced "collage". His second landmark work was Guernica (Reina Sofía, MadridCentro de Arte Reina Sofía), animpassioned condemnation of war and fascism. In his later years, Picasso turned to creations of fantasy and comic invention. Working consistently in sculpture, ceramics, and the graphic arts, he continued to explore his personal vision until his death at 91. This portrait represents the proto-cubist style -- a forerunner to cubism. • Photograph in later years (Site was down when last checked. You can find the archive here. 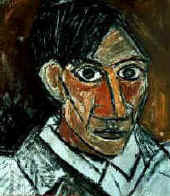 Picasso Artist Study - A great resource from Squidoo. Tempera Paint , Construction Paper , Scissors , White Glue , Oil Pastels . After viewing and discussing the works of Pablo Picasso, this group of eighth grade students designed these still life compositions. 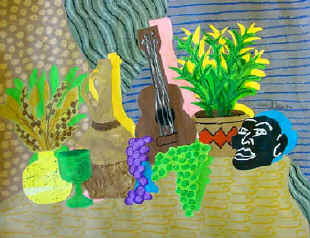 They began by sketching a still life set up in the art room from observation. The sketch was painted with tempera paint using a flat style and a neutral pallet. Collage papers were then created by mixing colors and creating texture by using sponges, spray bottles, and dabbing. These beautiful papers were cut into the appropriate shapes by using the beginning sketch as a template. After the shapes were glued in place, oil pastels were used to create patterns and enhance the overall design. 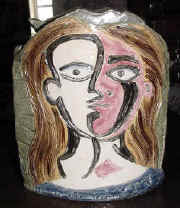 Interpret images in a way similar to Picasso. Investigate human portraiture while understanding the transition from reality to abstraction. Drawing Paper , Drawing Pencils , Colored Markers , Canvas or Canvas Panels , Acrylic Paint , Brushes , Acrylic Gloss Medium , water containers. Discuss life and work of Pablo Picasso. Discuss terminology. View Picasso's "Girl Before a Mirror ." Choose to either draw a reflected portrait of yourself or another person or three self portraits from three different views. Using markers, color these in complimentary colors. Simplify and alter your images. Tear it up, rearrange the parts, and glue the parts to a new background. Use this as a preliminary plan for a final painting. Have fun while you investigate. In continuing the investigation of human portraiture, approach the facial features with a "loosened up" attitude- again borrowing from reality and moving into abstraction. Interpret a model under a spotlight with Oil Pastels dipped in India ink . A hard black outline is the result. Use unrealistic colors to fill in shapes. 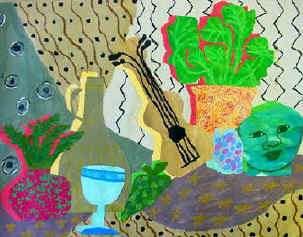 Incorporate collage - Still life of musical instruments. 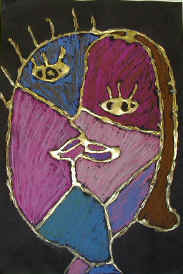 Paper Portraits A La Picasso: Take a blank piece of Poster Board (approximately 12" x 18" (30.5 x 46 cm) or use up the scraps). Plan at least four-six planes, fold or score the poster board where it changes directions. Make some of the changes on an angle rather than vertical. In line drawing, simulate eyes, nose, lips, ears, hair, etc. Apply paint or markers to further enhance. It should stand alone and be interesting from all sides and angles. 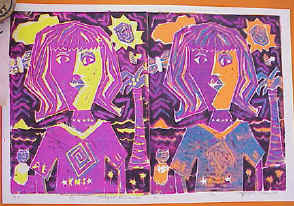 For Jeanette's lesson (left), students looked at "Girl Before a Mirror ". After a discussion of the work by Picasso, they drew their own Picasso style faces. They began with the shape for the face, then divided it to show a profile (multiple views). 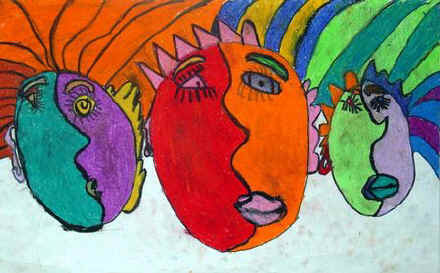 Students also drew the features in the style of Picasso. Once the faces were done, they added the hair to create flowing movement. They outlined with Sharpie markers. After a discussion on color plans, they were ready to color with oil pastels. See detailed plan on Incredible Art Department (copied with permission from Artsonia). After a discussion of Cubist style portraits by Pablo Picasso, students had the opportunity to create their own self portraits. Students drew on black paper (any dark color will work) - dividing the face to show multiple views and fracturing into shapes. Drawings were outlined with glue. After the glue was dry, students colored it with gold markers. Gold puffy paints can be used with similar results). Students colored their portraits with a limited color plan using pastels. Oil pastels also work well with this lesson. This lesson can also be done with plain glue on black paper - or using any color of puffy paint. Shown, student reduction print. Linoleum prints were rolled onto slabs to make vessels. Slabs were draped to shape (pots had football shaped base - with curved front and back). Some student made lids for their containers. Two of my favorite Picasso portraits of women. 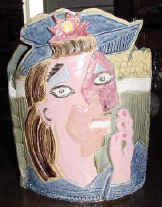 Weeping Woman was used for one side of the ceramic vessel above Pablo Picasso -Jaqueline with Flowers | Picasso's Weeping Woman- Ceramic example above used collagraph prints for the image. 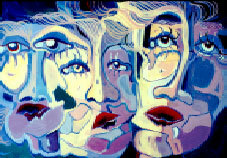 Middle School: Portraits to Picasso by Holly L.
Middle School: Cubism Painting, [Archive] from Westmont School district in Johnstown, PA.